Do you want positive customer reviews to show up when prospects search? As a business owner, you pour your heart and soul into your company to provide the best customer service possible. However, there are times when you won’t be able to make everyone happy, which can lead to a bad online review or negative comment. 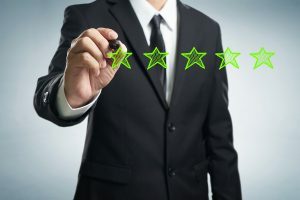 One bad review can quickly tarnish your online reputation, causing you to lose customers as 79 percent of consumers admit that online reviews weigh heavily on their purchasing decisions. Plus, more than half of consumers research a company online, placing their trust in a company based on the information they find. When bad reviews and comments become highly visible on social media, review sites, and search engine results, customers turn away, choosing another company with a more positive online reputation. This leads to frustration as your good name is drug through the mud, but what can you do to fix it? Ignoring the issue won’t make it go away. Instead, you need online reputation management to quickly resolve the issues that are hurting your online image. Our Scottsdale digital marketing agency has the knowledge, tools, and resources you need to maintain a strong and positive online reputation. We will work with you to help clean up negative content that’s haunting your business. After evaluating your current online reputation to discover any areas that may need to be resolved, we’ll create an individualized approach to rebuild and promote the positive about your company. We’ll increase the search visibility of positive reviews and comments on search engines, social networks, and websites to promote more control over the information found online about your company. In addition, we’ll help generate more positive reviews about your company with positive press to attract and maintain new and existing customers. Because we take your good name seriously, there’s no need to worry about a fake review damaging your credibility even more. Rest assured that we only create true and valid content by engaging your current and past customers and fans. Keep your best foot forward by calling us today to learn more about our online reputation management services.